Electrical Bus & Conductors, etc. 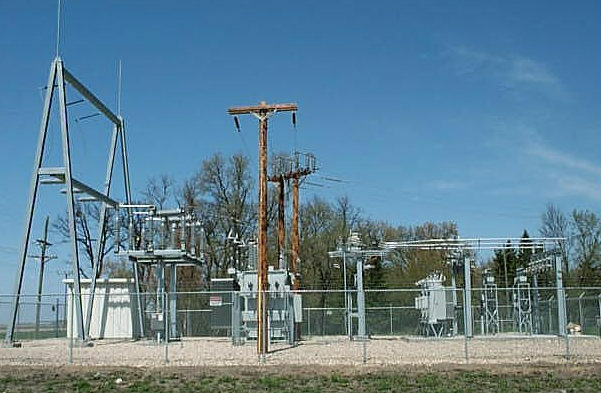 Shown below in figure 1 is a picture of a small power substation taken from Wikipedia. It shows various electrical power equipment – control house, switches, transformer, breakers, electrical bus, etc. P&C uses protection devices, such as, protective relays to protect power equipment from electrical faults or lightning strikes. Since the early 1900’s, these protective devices were known as electromechanical relays and operated by mostly mechanical moving parts. Electromechanical relays are electrically operated switches that use electromagnets to mechanically operate by opening or closing switches; these relays were near perfect devices for protecting the earlier power grid. Electromechanical relays were able detect abnormalities within the power flow, like over and undervoltage, overcurrent, over and underfrequency, and reverse power flow. With the digital transformation and creation of digital electronics including microprocessors, electromechanical relays were being replaced as early as the 1990’s with microprocessor-based relays that could perform more functions at faster speeds. These new intelligent electronic devices (IEDs) equipped with microprocessors were able to convert analog voltages and currents into digital values along with emulating all the discrete functions of multiple electromechanical relays in a single device, ultimately, streamlining design protection, space requirements, and routine maintenance. Today, microprocessor relays or IEDs have evolved into smarter, more intelligent devices, capable of performing internal tests and indicating whether it is operating properly or malfunctioning. IEDs can detect various faults from many different protection schemes while producing power flow waveforms, metering functions, and communication exchanges with supervisory control and data acquisition (SCADA). These microprocessor-based relays can also accommodate many protection settings aiding the relay protection engineer and also allowing the relay to be placed into a maintenance mode for substation maintenance personnel. IEDs perform several functions that simply cannot be duplicated with electromechanical relays. Today most power utilities have replaced all their electromechanical relays with IEDs or smart microprocessor relays. Today’s IEDs are much more reliable than legacy electromechanical relays, and they perform a better job of ensuring power system stability by clearing and isolating faulted components much faster, while providing power system real-time information. Shown below in figure 2 is a comparison of GE electromechanical relays versus one SEL IED. Similar to electromechanical relays, the IEDs sense electrical faults from current transformers and potential or voltage transformers while initiating power circuit breakers to open or trip in order to clear and isolate faults on generators, transmission lines, transformers, and electrical bus, including failed power circuit breakers. This art of design and coordination of clearing electrical faults is extremely important in order to protect expensive equipment, since standing faults can permanently damage power systems. For example, replacing a failed high-voltage (HV) transformer today could cost north of $500,000 or over $1 million, including design and construction costs. It could cost more, if not double, as large electrical fires grow, thereby, causing more damage to other power equipment. Also, it may take up to 6 months or more to receive a new transformer from the manufacturer if no spares are on hand. Poor P&C designs that do not properly coordinate and detect electrical fault conditions could cripple the utilities’ power systems. For this reason, it’s extremely important to have a near perfect P&C design. Shown below in figure 3 are two large high voltage transformers taken from Wikipedia. Reliability – The power equipment must always perform as intended. Availability – The power equipment must operate during abnormal conditions or when called upon. Maintainability – The power equipment must be repairable within a very short time interval. Security – The power equipment must be secure from any physical or cyber breaches and intrusions. When power system faults take place, usually power interruptions and disruptions to power users or customers occur. This can result in dropping electrical service to one customer, several customers, or an entire town or city. If an entire city is without power for five to ten minutes or more, what is the economic impact of the lost productivity? It is huge! P&C design and coordination is not only important for the power utility provider, but it’s also important for the customers, in restoring the customers’ electric power as quickly as possible. Some chemical manufacturing facilities are affected by a 15-minute power outage which could result in costing them close to $1 million to reset their factory equipment, processes, and chemical mixtures. Reliable power is a necessity for these facilities. 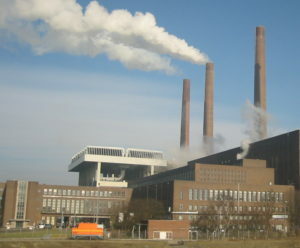 Shown below in figure 4 shows a large manufacturing plant that relies heavily on reliable electricity. As IEDs contribute major benefits, security risks are also of great concern. As cyber threats to power utilities continue to be a growing concern, cybersecurity protection for P&C devices must evolve into more robust and more secure designs. Designing P&C systems with security in the beginning is more important than trying to add security to an existing P&C system. Preventing unwanted actors or hackers from accessing power protection systems and IEDs should be a top priority for utilities in order to uphold their power grid reliability and resiliency. At 3 Phase Associates, we look forward to helping you upgrade your existing T&D power systems to more advanced and secure protection systems. We can help you transform your power grid and control systems into a more secure and smarter grid, as it relates to physical/cybersecurity, P&C, IEDs, SCADA, telecommunications, etc.